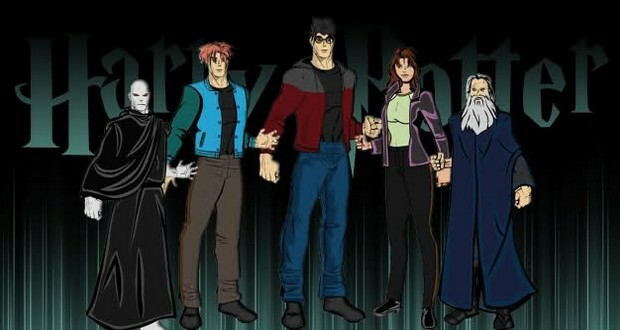 Warner Bros. originally considered making the entire “Harry Potter” series as a set of CGI animated films, or attempting to combine several of the novels into a single movie. The studio’s reasoning mainly had to do with concern over the rapid aging of child actors-if production ran too long on any of the films, or if production was delayed between sequels, the leading actors might have to be recast. Author J.K. Rowling vetoed both the ideas of combining books and an animated film, so the studio decided instead to produce all seven (later eight) films back to back so that the same child actors could play their roles in every film. 2. Child actors were allowed do their actual schoolwork during the filming of the movie to make the school setting more real. 3. The Restricted Section scene in Philosopher’s Stone was filmed in the Duke Humfrey's building at the Bodleian Library in Oxford. The library has very strict rules about not bringing flames into the library. The makers of Harry Potter were the first ever to be allowed to break this rule in hundreds of years. 4. The inscription around the Mirror of Erised says: "Erised stra ehru oyt ube cafru oyt on wohsi". Reading the inscription backwards it says, "I show not your face but your heart's desire." 5. The filmmakers originally wanted to use Canterbury Cathedral as a filming location for some of the Hogwarts scenes, but the Dean of Canterbury refused to allow it, saying that it was unfitting for a Christian church to be used to promote pagan imagery. Gloucester Cathedral agreed to take its place; the Dean of Gloucester, the Very Reverend Nicholas Bury, admitted to being a fan of the books. Nonetheless there was a huge media outcry in Gloucester when it was decided to use the local Cathedral as a filming location. Protesters wrote letters by the sack-load to local newspapers, claiming it was blasphemy and promising to block the film-crew's access. In the end, only one protester turned up. 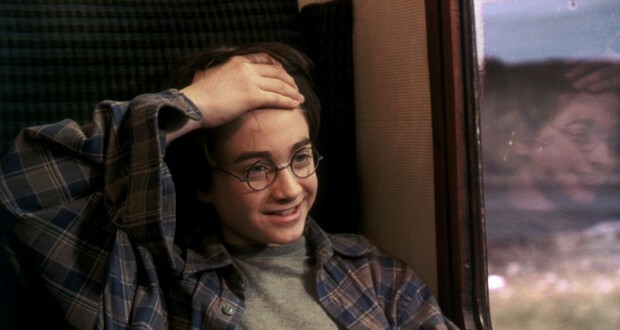 The scar on Harry's forehead is off-center. This was done at J.K. Rowling's request. Due to the artwork on the covers of her books, many people have assumed that his scar is supposed to be in the center of his forehead. The books, however, never specify exactly where on his forehead the scar is located. 7. Author J.K. Rowling revealed on her website that she was considered to play Lily Potter during the Mirror of Erised scene in the first movie, but she turned down the role, which instead went to Geraldine Somerville. 8. The floating candles in the Great Hall for the first movie were created using candle-shaped holders containing oil and burning wicks and suspended from wires that moved up and down on a special effects rig to create the impression that they were floating. Eventually one of the wires snapped due to the heat of the flame causing the candle to fall to the floor. Fortunately no one was injured, but the decision was made to re-create the candles using CGI for the following films as using real candles was determined to be a safety hazard. 9. When holding auditions for the role of Hermione, the casting team traveled around to local British elementary schools to hold auditions in hope to find their actress. When they arrived at Emma Watson's school, she had no desire to audition despite nearly every single girl in her school wanting to. It was encouragement from her teacher to at least attempt the audition that made her be the last girl to audition of her whole school. 10. The floor in the great hall is made of actual York stone. Production designer Stuart Craig had the foresight to invest a significant amount of his design budget on the stone. While this decision was questioned at the time, it proved to be a wise one, as the stone was durable enough to withstand the footsteps of hundreds of actors and several camera crews over the near decade it took to film the entire series. Hagrid is 8 feet 6 inches tall. 12. Throughout the whole of the Harry Potter series, Daniel Radcliffe went through 160 pairs of glasses. 13. The trouble-making poltergeist Peeves (played by Rik Mayall) does not, in the end, appear in the first movie nor in deleted scenes on any home editions of the film. Mayall claimed he didn't find out that he was cut from the final cut until he saw the movie himself. Ultimately Peeves was never used in any of the Harry Potter films. 14. In the first movie, Neville receives a remembrall from his grandmother but he doesn't remember what he has forgotten. In that scene, Neville is the only student without his robe on. He must have not remembered to put his robe on. 15. Originally the script called for Hermione to slap Malfoy as opposed to punching him in 'Prisoner of Azkaban'. During rehearsal for the scene Tom Felton told Emma Watson to slap him, however he had intended for her to not actually hit him, and thus was taken by surprise when Emma smacked him across the face as hard as she could. Emma said she felt terrible about it afterwards and didn't know what she was thinking. Despite his initial reluctance to accept the role of Albus Dumbledore, Richard Harris, who portrayed Dumbledore in the first two films, was determined to portray the character through the entire series. However, following the filming of Harry Potter and the Chamber of Secrets (2002) Harris was diagnosed with Hodgekin’s lymphoma. During post-production on that film, producer David Heyman went to visit Richard Harris in the hospital. Though he was very weak from his illness, Harris insisted that the role of Dumbledore not be recast. Sadly, Harris passed away shortly before production was to begin on Prisoner of Azkaban, necessitating a recast. 17. Ian McKellen turned down the role of Dumbledore. Having appeared as Gandalf in The Lord of the Rings, he said, “I had enough trouble living up to one legend. Two would be too much to hope for.” He also stated it would have been inappropriate to take Richard Harris' role, as the late actor had called McKellen a “dreadful” actor. 18. In the Prisoner of Azkaban, to make the Knight Bus appear as if it was zipping through traffic at an extremely high speed, the scenes were filmed with the bus driving at normal speed and the rest of the traffic driving at snail’s pace. The film was advanced though the camera at a slower rate than it would eventually advance on screen. When the scene was played back at normal speed, the bus appears to be driving super-fast. 19. Harry Melling had lost so much weight that the role of Dudley Dursley was almost recast for the third installment of Harry Potter movies. Eventually it was decided that Melling would continue to play Dudley and would wear a fat suit to make him look heavier. 20. During the filming of the sleeping bag scene in Prisoner of Azkaban, director Alfonso Cuarón, Michael Gambon, and Alan Rickman played a practical joke on Daniel Radcliffe (who had requested to have his sleeping bag next to a girl whom he liked at the time) by hiding a remote-control-operated Whoopee Cushion in his sleeping bag. According to Cuarón, Daniel tried really hard to stay in character while everyone else was laughing. When designing the Marauder's Map, graphic designers decided to stray from the traditional rolled-up treasure map with burned edges, and designed it instead as a folding map with many layers, each representing a different level of Hogwarts Castle. The shapes of the various areas and objects depicted on the map are defined with written words as opposed to draftsman’s lines. The map was printed on white paper and subsequently “aged” using a rich blend of coffee in order to give the appearance of old parchment. 22. When we see the Marauder’s Map for the first time, the name ‘Newt Scamander’ can be seen. In the Harry Potter universe, he wrote the book “Fantastic Beasts and Where To Find Them”, but isn’t a teacher at Hogwarts. 23. Early in the third Harry Potter movie (Prisoner of Azkaban), Harry sees a newspaper article with a photograph of the Weasley family in Egypt. Though it is never again mentioned, this is a very important plot point in the book. While on an inspection of Azkaban the Minister of Magic had a copy of that paper, and gave it to Sirius Black who recognized Peter Pettigrew disguised as Scabbers. This is what made him decide to break out of Azkaban, track down Scabbers at Hogwarts, and take his revenge by killing him. 24. Although the Marauders' Map, created by Messrs Moony, Padfoot, Prongs, and Wormtail plays a large part in the third Harry Potter film, the identities of the first three are not made clear. This is surprising as this was important to understanding this plot in the book. Moony was Lupin, who was supported by his three friends. These learned “Animagus” shape shifting techniques to sympathize with him. James Potter was Prongs the Stag (a trait passed on to the Patronus of his son Harry), Sirius Black was Padfoot the Dog, and Peter Pettigrew was, more obviously, Wormtail the Rat. 25. The filmmakers attempted to go the extra mile of matching the kid's appearances to how the novel describes them, by fitting Daniel Radcliffe (Harry Potter) with green-colored contact lenses, and similarly make Emma Watson (Hermione Granger) wear fake buck teeth. But when Dan's eyes reacted strongly to the contacts, and Emma couldn't talk clearly with the fake teeth in her mouth, these ideas were dropped. Fact number 9 is incorrect. When you click on the “source and more” button below, the article clearly says that Emma Watson auditioned for the role of Hermione with her friends because they all thought it would be fun, not because her drama teacher convinced her to. Her drama teacher only recommended her to casting agents. It’s also not said in the article that Emma was the last girl in her school to audition.